This is one of the first beers I ever had legally. It was just after my 16th birthday and I was in Germany the beer capital of the world. I remember it fondly so hopefully this lives up to my memories of it on a warm day in Germany. 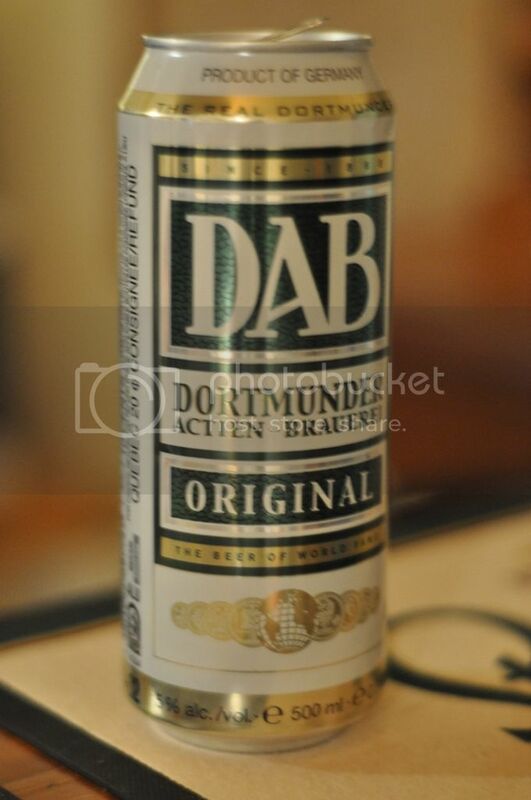 Basically a Dortmunder is a pilsner, made mostly for export, originating in the industrial heartbed of Germany; Dortmund. It is typically a very light and refreshing style of beer. I prefer to drink this beer from the can, so it is obviously difficult to describe the appearance of this beer. However from past experiences it is a light straw colour with a thick head, which laces quite well. From this experience I can say that the can is excellent, much more detailed than most European beer cans, definitely one for the collector. The awards this beer has won are there for all to see on the front of the can, it's definitely a promising start. The aroma is pretty non-descript. It smells like a nice light lager, there are some weak hops and some grass in the aroma but it is very weak. At least this beer smells very clean, slightly malty, but by no means is it skunky. This is the epitome of a German pilsner. It is very light, crisp beer with minor grain notes. Absolutely nothing fancy about this beer, it is just a very nice refreshing beer. There is an initial crisp bite to the beer, but after that there is nothing to offend anyone. This beer would be a spectacular beer to drink on a hot afternoon, and you could knock back as many of these as you want. You would never get tired of this beer it is sensational. I drank this beer as part of my alphabet challenge a while ago and really enjoyed it. I can definitely say this beer is better in a can than a bottle. It's also cheaper in this form, definitely a good beer to try if you have never had it, as you will fall in love with it. Save this one for summer.